We can help you file your DACA application. Cost to you is $0.00. We are offering a free legal clinic for all youth who qualify and wish to apply for Deferred Action (DACA). Each applicant will receive immediate assistance with preparing your application and will consult with an immigration lawyer, who will review your qualifications and documents and conduct a brief interview to determine if the DACA program will benefit you. • This event is not a briefing. • This is an opportunity for you to get help filling out your application for deferred action on the spot, completely free of charge (except for the filing fee mandated by the federal government). • Ample parking behind the building. Advance registration is not required for applicants, but those who register in advance will receive informative updates. If you are under 18 years of age, you must be accompanied by a parent or legal guardian. We are in need of volunteer attorneys, general volunteers & sponsors who can contribute food or monetary donations. All volunteers must arrive at 9:30am for required orientation. To make a donation or for more information please contact Kimi Wei kimi@bergenlatinos.com. 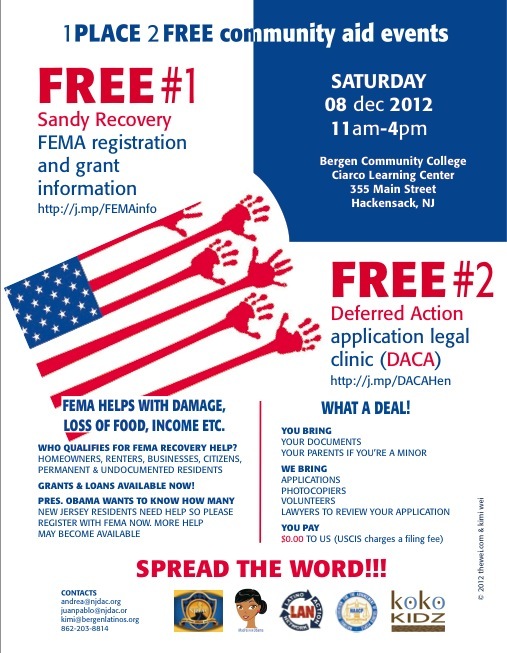 Bergen Community College Latino American Student Assoc. This work by kimi wei is licensed under a Creative Commons Attribution-NonCommercial-ShareAlike 3.0 Unported License. 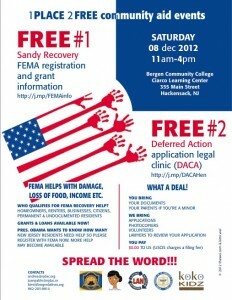 Based on a work at http://bergenlatinos.com/blog/free-legal-help-with-deferred-action-applications/.